Brainwave entrainment is the process of guiding your brainwave activity into a desired state by allowing it to follow, to “entrain”, to the frequency of an audio signal. Every state of mind is accompanied by a certain set of brainwave frequencies representing the electrical activity in your brain. You simply guide the electrical activity of your brain into the frequency range associated with a state of deep trance—et voila!—you achieve a deep state of trance! However, the brainwave frequencies we are trying to achieve for a state of deep trance are much lower than anything the ear can hear… at around 4-16 hertz. In order to deliver a signal the brain can hear and follow, Zen Melodies uses two different methods. Although the ears can’t hear a tone at 7Hz, we can deliver a tone of let’s say 400Hz to the left ear and 407Hz to the right ear. The brain will the create a 3rd tone from the difference between the beats at 7Hz. Even though this 7Hz tone is nothing more than an electrical signal originating inside the brain, you can still hear it as if it were an audible tone. The brain will then entrain to that frequency, gently placing you into a deep state of meditative trance. Another way to shape your brainwave patterns with sounds is by “pulsing” the tones at the desired frequency. With isochronic tone brainwave entrainment the audio signal is the same in each ear, but the volume is turned up and down at the desired frequency, 7 times per second in this example. This results in a distinct pulsing rhythm in the audio, and even though the conscious mind cannot follow the rate of 7 pulses every second, the brain hears it and follows. 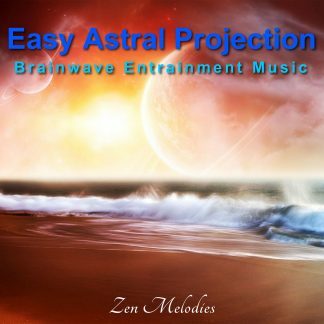 Zen Melodies music utilizes a mix of soothing, ambient soundscapes embedded with binaural beats and isochronic tones to deliver one of the most effective, deep and pleasurable hypnotic trance experiences possible. This same technology is also used in several Zen Melodies tracks to create states of intense mental focus, motivation, pain relief, and even profoundly altered states of consciousness. 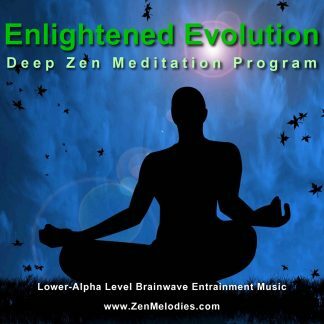 Visit the shop to Buy Meditation Music here.